Eumig Makro Sound 64 XL. motor runs and power zoom works. Unknown working condition.Leather case has more general wear. I carefully check every item for stains or holes andindicate if there are any defects.but I'm not perfect. 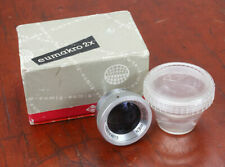 EUMIG EUMAKRO 2X, WITH WORN BOX, BUBBLE, INSTRUCTIONS AND DEPTH-OF-FIELD TABLES, GLASS HAS DUST AND DEBRIS, LOOKS EX. You are buying from a professional photographic dealer. You should expect everything to function reasonably well, and that all optics have no problems that would noticeably affect image quality, unless we describe them otherwise. Good display item. Recently we have had problems with people not understanding how their item works. Eumicron 6.25mm, 12.5mm, and 31.25mm lenses. Good display item. Case, lens cap, and instructions included. Recently we have had problems with people not understanding how their item works. Shutter has not been serviced. Unknown working condition. Leather case has more general wear. That's less than it will cost us. We want you to be happy. You are responsible for them, and we do not know how much they will be. Vintage Eumig Microphone. condition, used with some wear. Press to translate. By buying this item you agree to these rules. (A beige box with a red lid labeled "Eumig Compendium" with assorted bits as shown. Says "Process before March 1979" :). It doesn't seem to plug in anywhere. For display only. Sold as is. 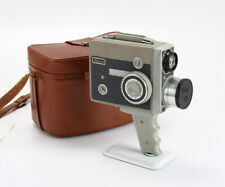 Camera is in great condition and is in original packaging. Great condition - refer to photos. 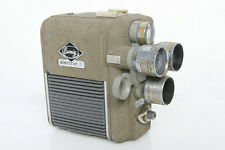 EUMIG NAUTICA UNDERWATER SUPER 8 CAMERA IN ORIGINAL BOX ! MINT CONDITION !! Rubber on the door is in great condition, as new. Made in Austria. Eumigon / Wien -- Lens. Normally not a problem. Made in Austria. Lens need cleaning (minor). Plenty of stuff out there. Maybe the wind crashes a shelf and your item is broken, no longer available. We all want things to go smoothly and we're all learning as we go. Really, I have had this happen. It was used as macro binoculars. So it's being sold as is. The best impression gives always the pictures. It is not possible to test them all. Small signs of use are normal. mint ✪✪✪✪✪, very well ✪✪✪✪, good ✪✪✪, usable ✪✪, defect ✪. The lens looks clear, except there is a little bit of fungus on the inside. There is one small dent on the outside of the viewfinder, but it does not change how well you can see through it. The focus and the zoom are smooth and easy to use. Seems to work good in most functions, what I can judge. The lens is an Eumig Eumigon 12,5mm 1:1,9 #25351. Made in Austria c 1955. Söders Fotoservice. You are responsible for them, and we do not know how much they will be. We want you to be happy. 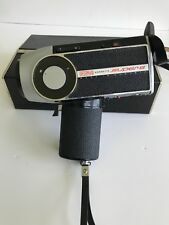 VINTAGE Eumig Live Sound 30 XL Super 8 Camera, untested, sold as is, it shows signs of age, some scratching, some corrosion on battery compartment, comes with microphone, leather case, earpiece and manual. Please see pictures. Thank you. DO NOT KNOW HOW TO TEST. This could possibly be repairable. Sold as-is. ITEM CONDITION. ~ CC ~ Spares ~ Repair ~ Eumig ~ 860 ~ PMA ~ Eumig ~ Viennette 3 ~ Makro ~ Set ~ 100% To Children's Hospice South West ~.